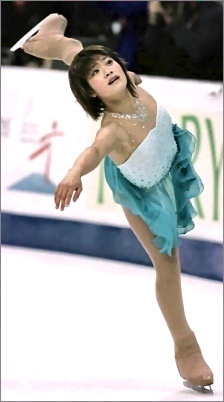 Japan’s Yoshie Onda jumped into the 2002-2003 figure skating season with power, winning the Bofrost Cup in Germany and the NHK trophy in Japan, and taking the silver at Trophee Lalique in France. Japan’s Yoshie Onda jumped into the 2002-2003 season with power, winning the Bofrost Cup in Germany and the NHK trophy in Japan, and taking the silver at Trophee Lalique in France to easily qualify for the ISU Grand Prix Final in St. Petersburg. She also finished second at Japanese Nationals, her best finish there. But an ankle injury forced her to withdraw from both the Final and the Four Continents Championships, at which she had won bronze medals in both 2001 and 2002. Onda recovered in time to compete at the World Championships in Washington, DC, but was still not at full strength. She finished 11th, down from her fifth place finish in Nagano in 2002. She also finished 12th at the Olympics that year. She landed her first triple toe loop when she was 13 and quickly mastered all the other triple jumps, landing her first triple Axel two years ago in practice. Her first triple Axel in competition came at the Grand Prix in Germany in 2001. Onda said she had tried a quad, “but it didn’t look very good,” she said. “I like to jump,” she said. “I like the toe loop and the Axel best.” Last season, she included the triple Axel in her long program. Onda’s programs are choreographed by Mihoko Higuchi and David Wilson. Last season, she used Love in Slow Motion for her short and Concerto for Cello and Orchestra and Serenade for the long. For her exhibition program, she used Seaside Rendezvous by Queen. “I like to skate to something cheerful,” she said. “Off ice, Onda listens to Western pop music and likes Michael Jackson, the Backstreet Boys, and Eminem among others. Onda said she doesn’t do much outside of skating. “I don’t collect anything or go shopping or to the cinema,” she said. “I just do a lot of homework. I love computer games and enjoy going to the Internet café and reading comics online.” She doesn’t play any other sports now but used to play badminton and soccer. “I tried to play tennis but I just hit a home run with my tennis racket,” she said.